The Costa Rica El Palomar was carefully roasted for you by Anodyne Coffee Roasting Co. Grown by Jorge Monge Garbanzo in the Cedral, Aserri region at 1,750 meters, this fully washed coffee is a perfect example of why we love coffees from Costa Rica. 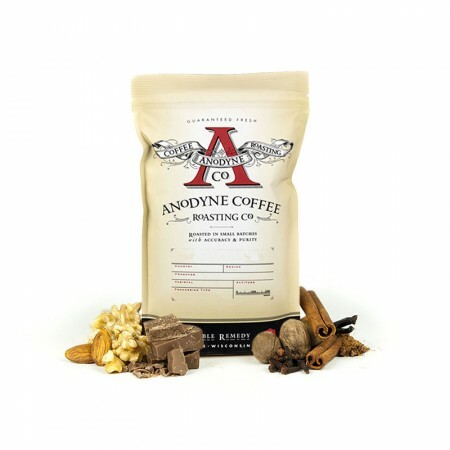 We like this coffee for its nuanced notes of chocolate and caramel and rich overall quality. It tasted a too sour or acidic for my liking. I enjoyed this bean. It's not as flavorful as the other two beans in my subscription. It reminds of of the Day Tripper Blend (Good Folks Coffee Co) beans but not as flavorful. great aroma and color. can definitely smell and taste the chocolate and somewhat caramel notes. i would describe it as on the light side of medium, and would like to try something on the darker side of medium. Love it! Used in a Chemex and Espresso - both were great. Enjoyed it, but the notes weren't as prevalent as I expected. After spending time with this coffee this week.. my wife really enjoyed it. We found it to be very smooth. Could definitely taste the chocolate and caramel notes. I found it be one note, which isn't a bad thing, but nothing super memorable. The beans were tiny and "old looking" which is my wife's favorite! I preferred the one before, but loved the coffee none the less. I enjoyed the coffee. For the next pick lets look for something with the same flavor profile but with a darker roast. Our favorite coffee so far! It had that nice caramel taste, and a much more approachable acidity level than usual. This coffee was a bit too light for my liking. Some of the smoothest coffee I've ever had! Smooth, mellow, with a slight "creamy" texture. Another excellent coffee. Good cup a coffee but not the best. Good coffee. Kind of boring but sometimes boring is good. Awesome cup. Keep 'em coming Seth. Nice chocolatey flavor. Good results with inverted aeropress and pour over. I could drink this coffee non stop. Very good. No matter what I did it brewed pretty weak. Drinkable but not great. I really liked the richness of this coffee. My favorite so far! The flavor was deep, rich, and smooth. wow, this is the coffee i dream of making at home. Used the inverted aeropress method and Bamb - real coffee at home. Beautiful, rich coffee. Rich, flavorful. The only thing different about this one was the difficulty to grind the beans, more than others. This one was nice. a nice chocolate flavor. We have loved everything from Anodyne, and this did not disappoint. Very clear flavor notes, especially the gingerbread-esq taste. A unique coffee that sits pleasantly on my palate. Great choice! Very good, much lighter and brighter than the La Colombe Corsica (which was a little heavy/bitter for me when brewed with a Chemex). Good flavor and finish. Really nice, consistent cup. Bright, nutty, slightly sweet with satisfying mouth feel - I am going through this bean fast! We liked the first coffee a little better. This roast was a little more acidic. We brewed it through pour over method, French press, and espresso shots. Good. Doesn't quite hit the highs of others. While I gave it the same rating as the Costa Rica El Bosque, the El Palomar is a tastier cup of coffee with a much fuller body. I really enjoyed the pronounced notes of chocolate. I usually prefer African coffees but this Costa Rican roast was very good. Makes a great cup of coffee. Really lovely chocolate notes, just a bit of sweetness. Light on the acidity compared to the other beans I've had recently. Probably my second favorite of the beans I've received so far. I did not enjoy the El Palomar as much as the Guatemala La Voz. There is a noted acidity and sour taste that I think is masking many of the subtle flavors. I notice a slight burnt flavor and aroma but I do pick up hints of milk chocolate. The body is a little light for my taste. I think next time we should try something a little darker. Very interesting palate, felt more acidic and more bitter than the Comucap. At first I didn't like the way the milk chocolate flavor mixed with the acidic quality, but through subsequent brews started to enjoy how layered the flavor was. Overall I think the Comucap brought together elements of creaminess to a more satisfying conclusion. Although I didn't love the combination of flavors/notes that the El Palomar brought altogether, I think it is a step in the direction towards the medium/light roasts I'm looking for. Would like to try more coffees like the El Palomar that have qualities of the acidity I associate with light roasts. This was my favorite out of all of the coffees ive received so far. The molassas is very highlighted, and makes the cup delicious. Always smooth and never bitter. This was a bit light. Not sure i am a big fan of this one. It's crisp but almost lacks a boldness that i've experienced in other Costa Ricans. Perhaps would like to try something bolder to venture outside of what i've had. Costa Rica consistently provides good full bodied coffee and this selection is no different. Nice aroma, minimum bite and excellent flavor.